Tips – How Steep is the Grade? 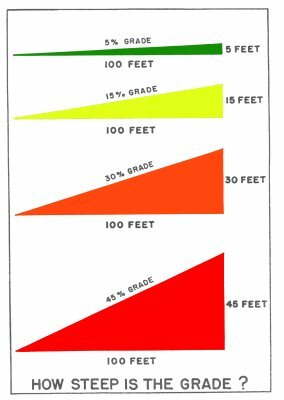 Home /Tips – How Steep is the Grade? Grade – According TM 20-205, Dictionary of United States Army Terms, 18 January 1944, a”slope of a hill, road, or railroad.” Steep downgrades. Make sure that your lowest gear is engaged before attempting to drive down any grade over 30 percent. Steep upgrades. Before driving up a steep grade, also make sure that the lowest gear is engaged. If the traction is poor you may have to use a winch. If you truck has no winch, you may get help from one that has. In the absence of a winch, ordinary block and tackle may be used. Driving over hilltops. When you drive over the top of a hill, if there is a sharp descent on the other side and you have too much speed, your front wheels may jump off the ground and come down with a bang. This is pretty tough on your vehicle and may cause you a lot of trouble. Pass over the crest of a hill slowly so that it will not happen. Information form TM 21-305, Driver’s Manual, November 1944.